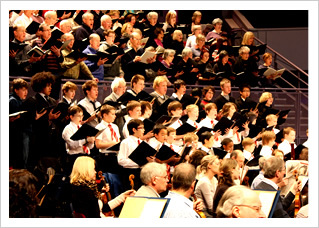 Last night the twenty-one Boys and sixteen Men of All Saints sang in concert with the Royal Philharmonic Orchestra and the Northampton Bach Choir at the Derngate Concert Hall in Northampton. The concert took as its theme the recent commemoration of Yom HaShoah, Holocaust Remembrance Day. The Choirs performed Gabriel Fauré’s Requiem and Handel’s Coronation Anthem, Zadok the Priest, and Andrew Zolinsky took the solo part in Chopin’s Piano Concerto No. 1. The capacity audience received the concert favourably and conductor Owain Arwel Hughes commented on the beauty of the Boys’ tone. 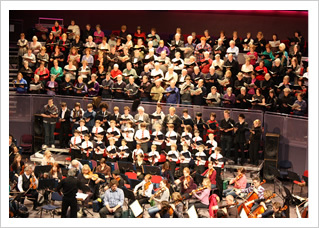 This is the first of a number of concerts that the choirs are giving this term. On Thursday 3 February at 7:00pm, the Girls’ Choir will mark the 100th anniversary of the birth of Jehan Alain with a concert of Romantic and Modern French choral music, including works by Alain. Then on Friday 25 March, the Annunciation of the Blessed Virgin Mary, and in the season of Lent, at 7:00pm the Boys and Men will be joined by the Tyburn Quartet to celebrate the music of Franz Schubert. The concert will include performances of his Mass in G D 167, Stabat Mater D 175 and Ave Maria D 839. This concert will conclude with a performance of Schubert’s Death and the Maiden Quartet, D 810. Our lunchtime recitals also continue, with the Director of Music’s ever-popular “Back to Bach” series continuing to draw large audiences on the first Thursday of each month at 1:10pm. This Thursday he will be exploring numerology in Vater unser im Himmelreich, BWV 682, and Vor deinen Thron tret’ ich ,BWV 668. There is an additional recital to mark the Liszt anniversary on 17 February at 1:10pm (including piano and organ works), and the programmes for the summer recital series are now finalised and can be viewed here.